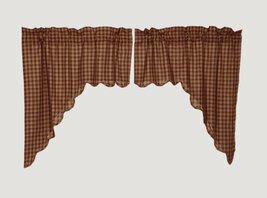 Bring a classic touch to your country home with the Burgundy Check Scalloped Prairie Short Panel. Sold in a set of two the burgundy & tan checks are blended with faded texture at points of intersection to give a modern facelift to the classic pattern. 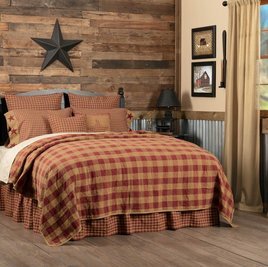 63" x 36" x 18"
Dimensions: 2 x Prairie Panel - 63" x 36"
Thank you for shopping our Burgundy Check Bedding & Curtains! Bring the charm of a farmhouse to your home with the Burgundy Check Scalloped Swag. The burgundy & tan checks are blended with faded texture at points of intersection to give a modern facelift to the classic pattern. Size: 36" x 36" x 16". Bring a classic touch to your country home with the Burgundy Check Scalloped Prairie Swag. Sold in a set of two the burgundy & tan checks are blended with faded texture at points of intersection to give a modern facelift to the classic pattern. 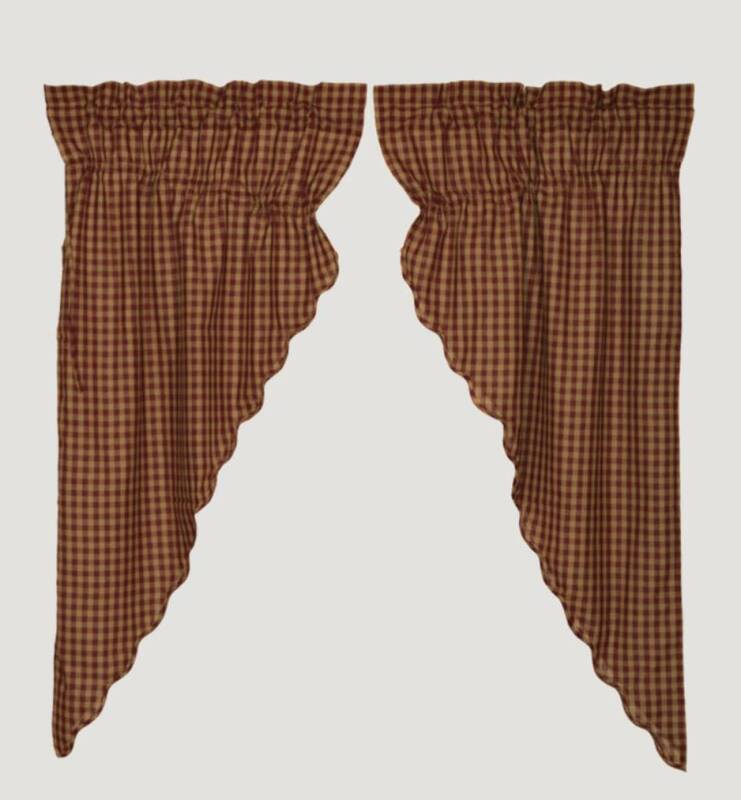 Bring the charm of a country farmhouse to your home with the Burgundy Check Scalloped Valance. The check pattern in burgundy & tan add a timeless touch. 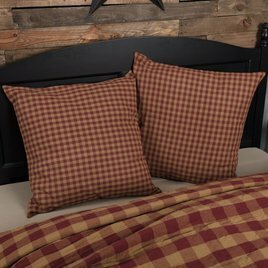 The Burgundy Check Quilted Coverlet is all about comfy and cozy! Dress your bed with these primitive colors to add a pop of color! 100% cotton, 4" diamond machine quilting on large-scale burgundy and tan check fabric. Reverses to solid tan fabric. 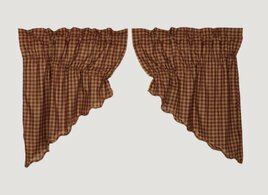 Bring the charm of a country farmhouse to your home with the Burgundy Check Scalloped Layered Valance. The check pattern in burgundy & tan add a timeless touch. 16" H x72" W, made of 100% cotton, Fully lined with a 2" header & 3" rod pocket. The rich colors of the Burgundy Check Scalloped Short Panel bring a finishing touch to your country home. 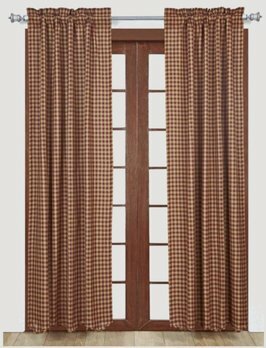 The burgundy & khaki check panel measures 63" L x 40" W & is sold in a set of 2 panels. 100% cotton fabric, scalloped edge & fully lined. The rich colors of the Burgundy Check Scalloped Panel bring a finishing touch to your country home. The burgundy & khaki check panel is sold in a set of 2 panels. 100% cotton fabric, scalloped edge & fully lined. 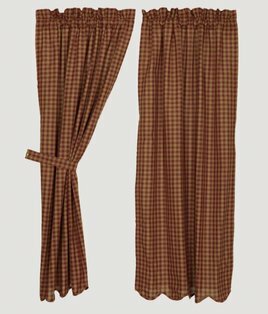 A soft, pattern with checks for an ultra-comfy and inviting primitive look. 4" diamond machine quilting on large-scale burgundy and tan check fabric. Reverses to solid tan cotton fabric. Colors: burgundy & tan. Panels lined, quilted, 100% cotton. Bring the classic look to your bathroom with the Burgundy Check Shower Curtain. 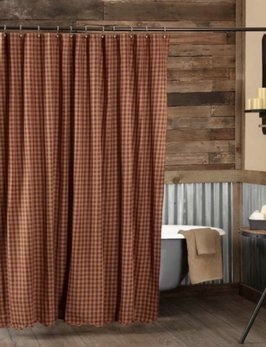 Burgundy and tan checks give this country shower curtain a classic look. Bottom edge scalloped with .5" bias cut binding; Machine stitched; 72" L x 72" W.